Questions about the new tax law? Wwhen you file your tax returns in April of 2019 it's the new law that will govern your filing. In 2017, it took only 7 weeks to pass the most sweeping tax overhaul in 30 years. 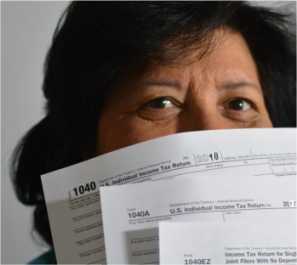 The haste with which the bill was passed means 2018 filing taxes (in April 2019) will be a challenge for individuals and some homeowners unfamiliar with the new code. • The new bill for eight years beginning on Jan. 1, 2018, will increase the standard deduction - to $12,000 from $6,350 for individuals, and to $24,000 from $12,700 for married couples. However, the new bill temporarily eliminates the $4,050 individual personal exemption for those who earn under a certain income cap. • Overall, the new bill anticipates reduced taxes for individuals by about $1,600 in 2018, with the largest benefit going to the wealthiest households. • Homeowners will no longer be able to FULLY deduct state and local property taxes plus income or sales taxes. Instead, the legislation allows individuals to deduct up to $10,000 in state and local income and/or property taxes and sales taxes..
• The tax changes for homeowners will affect individuals by location. Those living in high-tax states like New York, California and New Jersey, for example, could see an increase in what they owe Uncle Sam in April 2019. Small businesses, freelancers, and the self-employed will continue to be able to declare business expenses on IRS Form 1040, Schedule C (Profit or Loss from Business). Also see IRS Advice on Home Office Deductions. • The size of inheritances exempted from estate taxes will double - up from $5 million to $10 million per person. • The corporate tax rate will be reduced to 21 percent, from the current 35 percent. Unlike the temporary nature of the individual tax cut, the corporate tax cut is permanent. Again, these new provisions apply only to US residents filing their 2018 taxes in April 2019. While the filing deadline is in April, the earliest American can begin submitting their tax forms is the last week in January 2018. This year, the IRS will begin accepting tax returns beginning on Monday, January 29, 2019. Tax forms & instructions are in PDF format and require the Adobe Acrobat Reader to view, download & print.